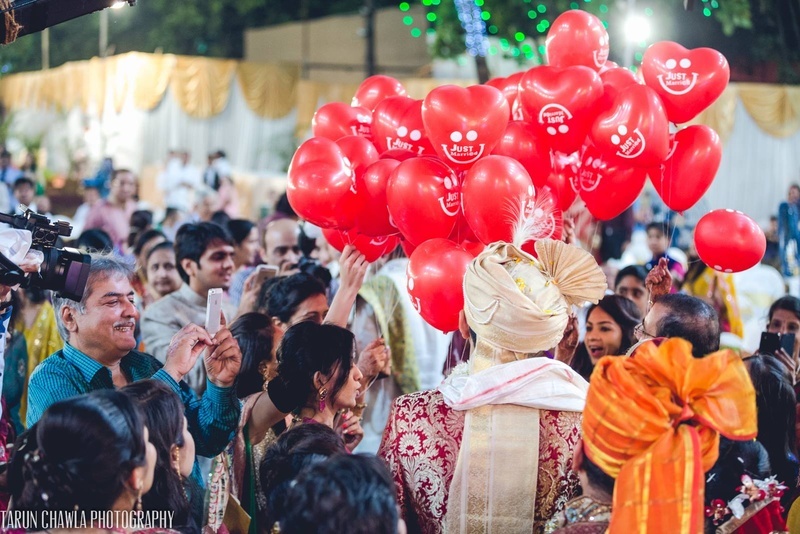 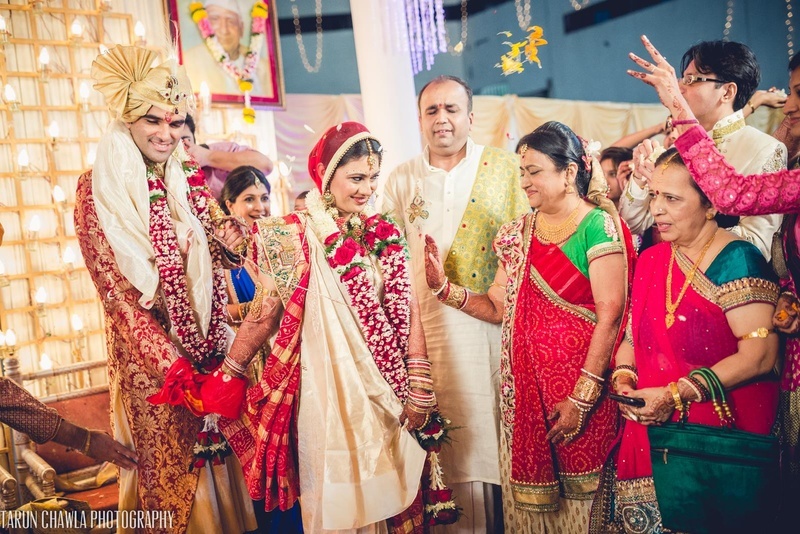 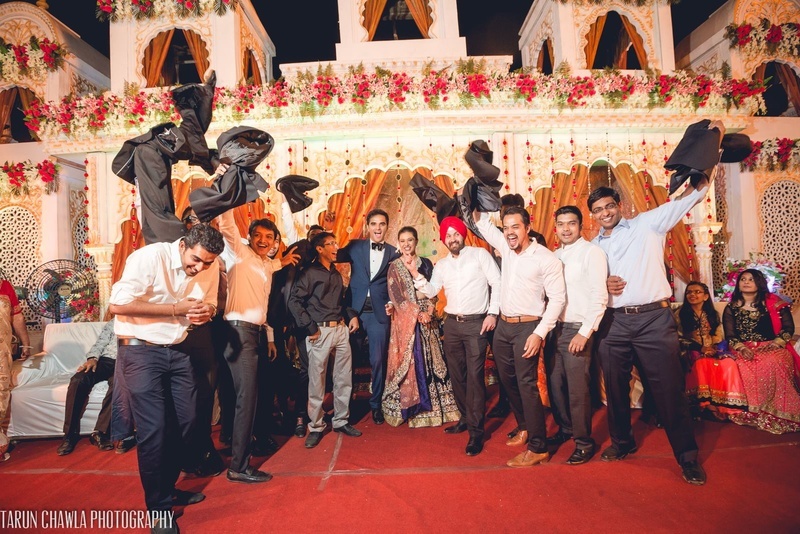 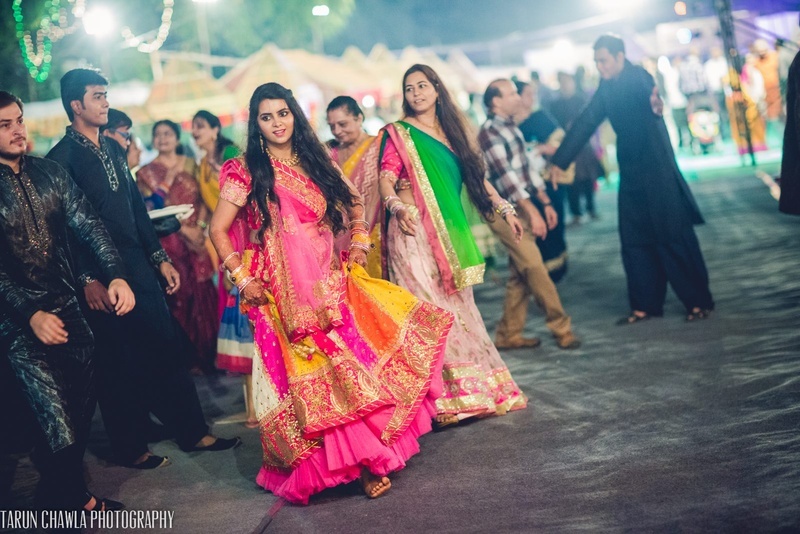 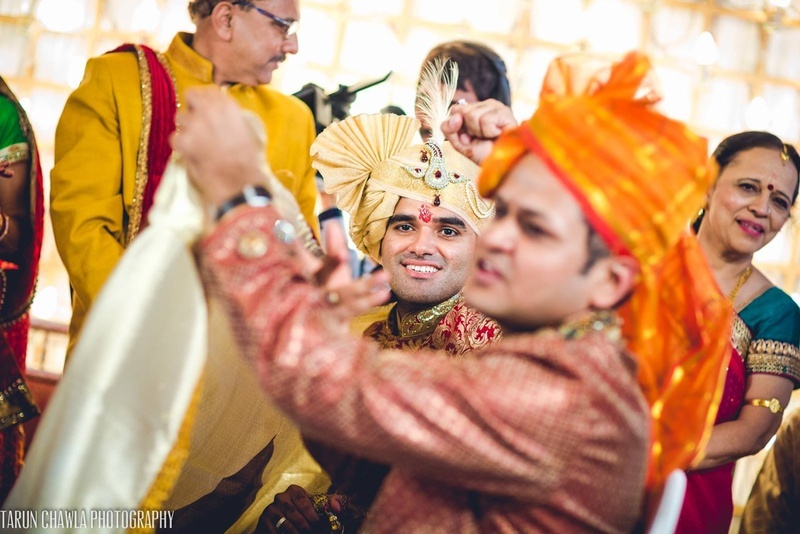 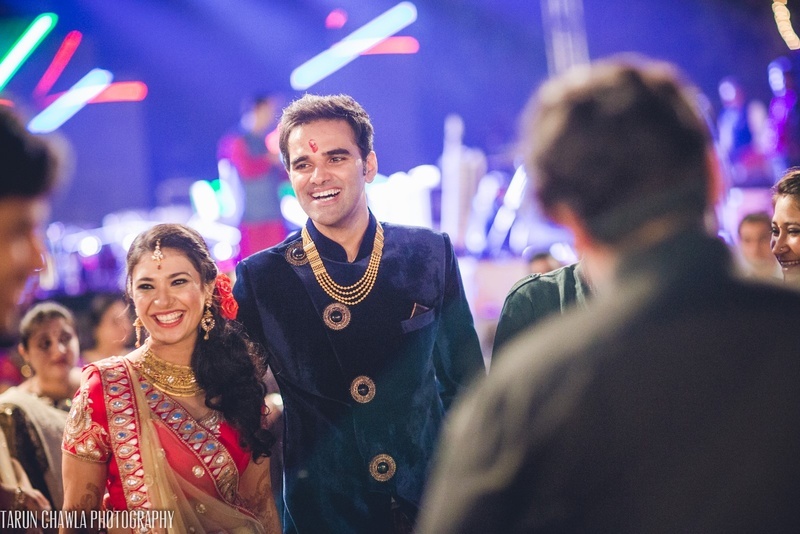 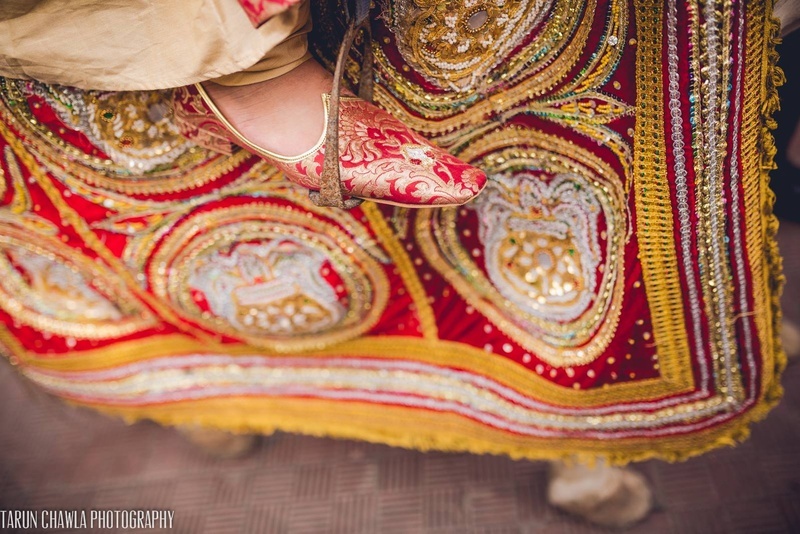 This Big Fat Gujrati Wedding was so full of love and color, we just couldn’t keep it to ourselves! 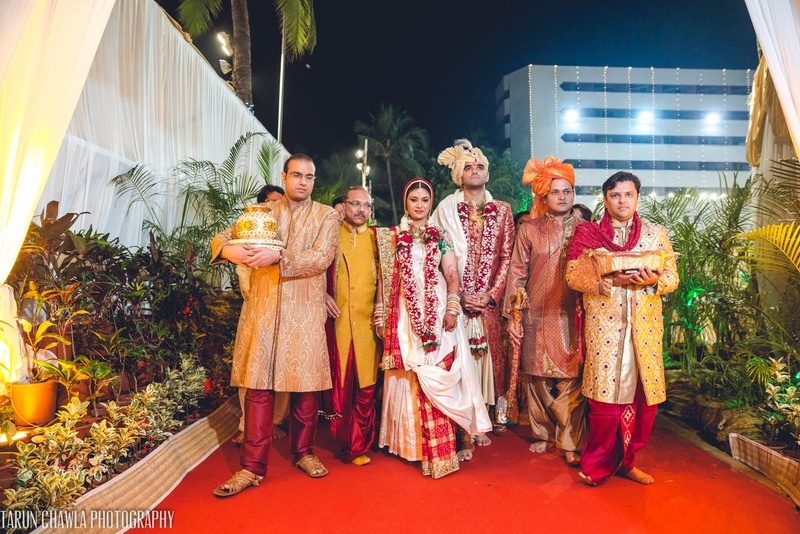 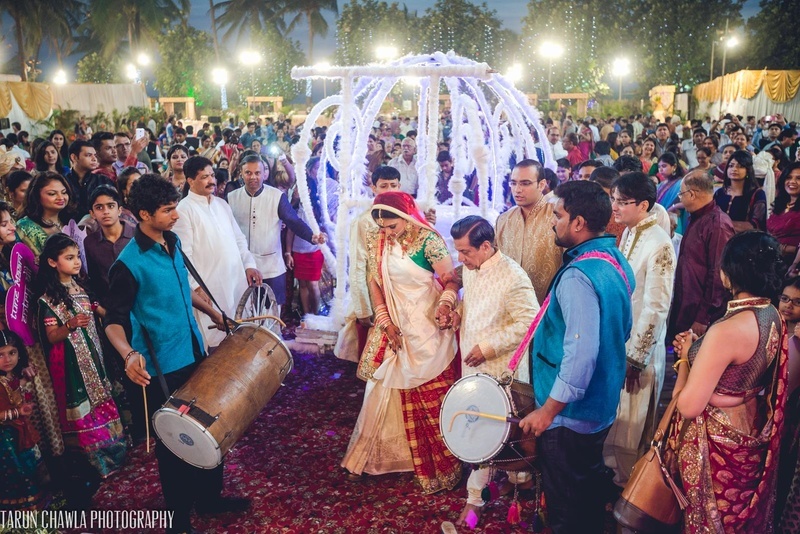 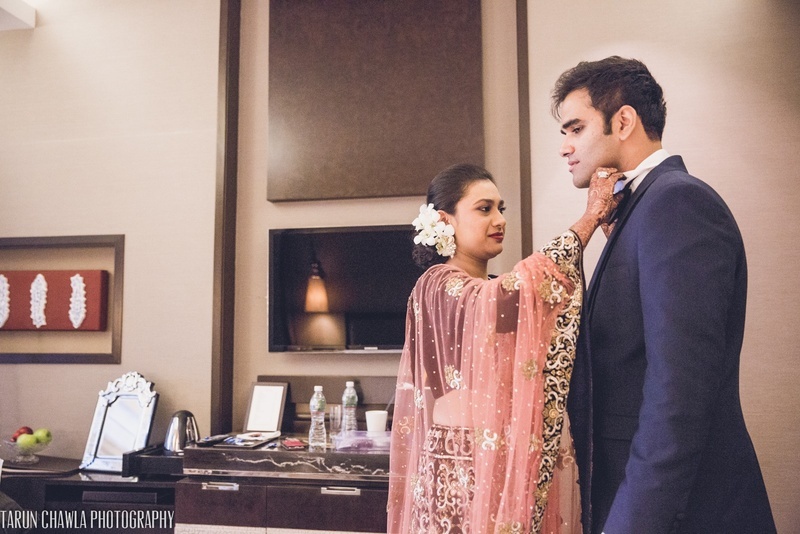 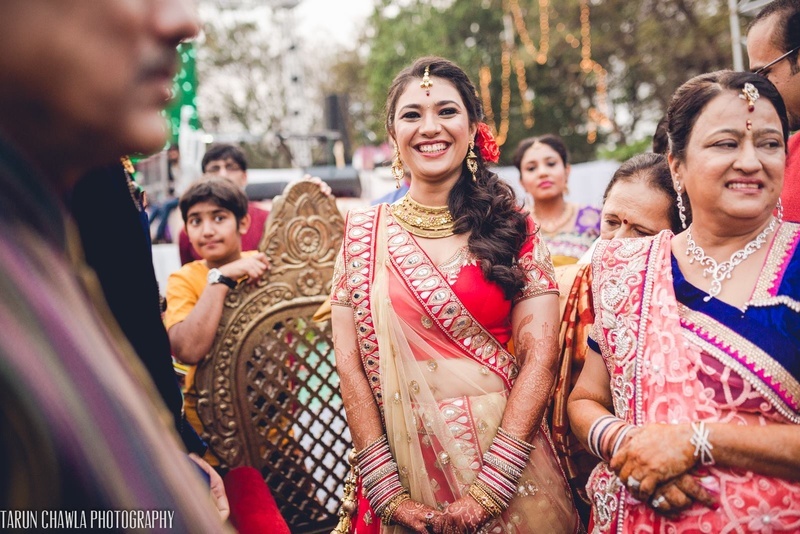 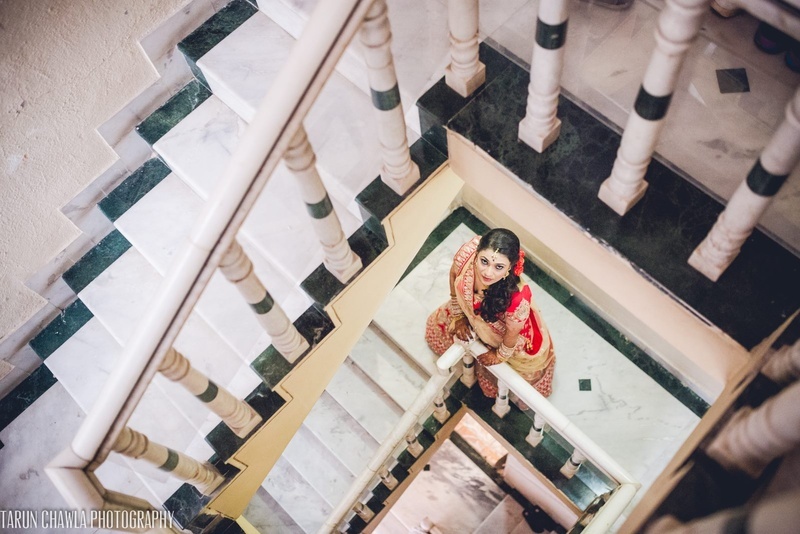 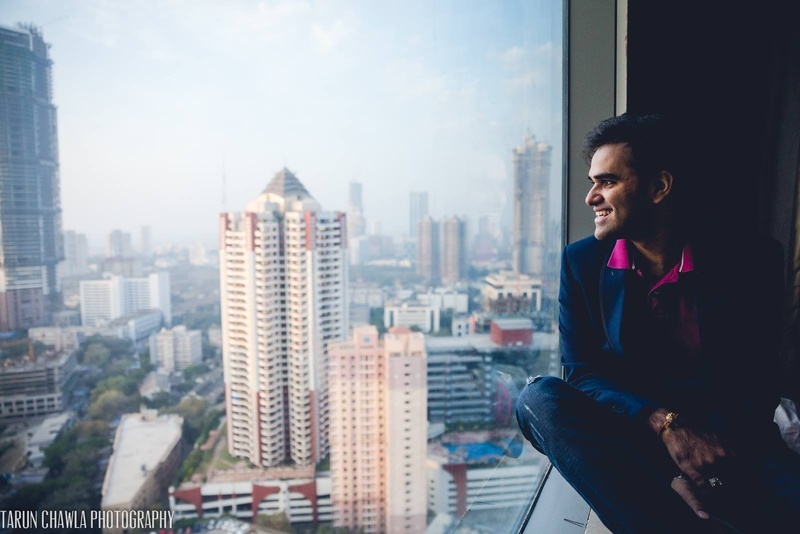 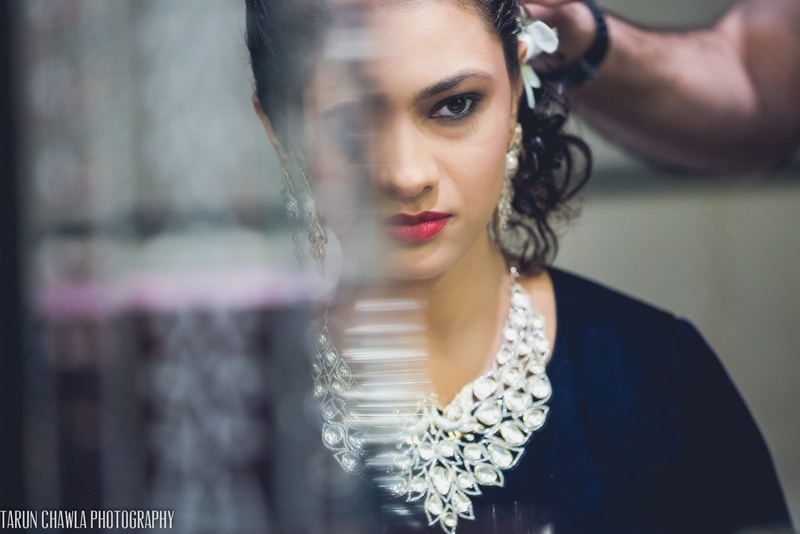 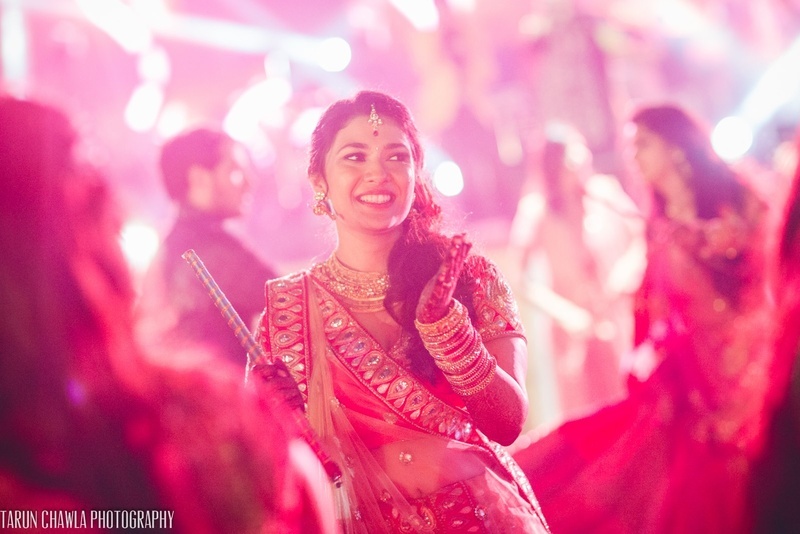 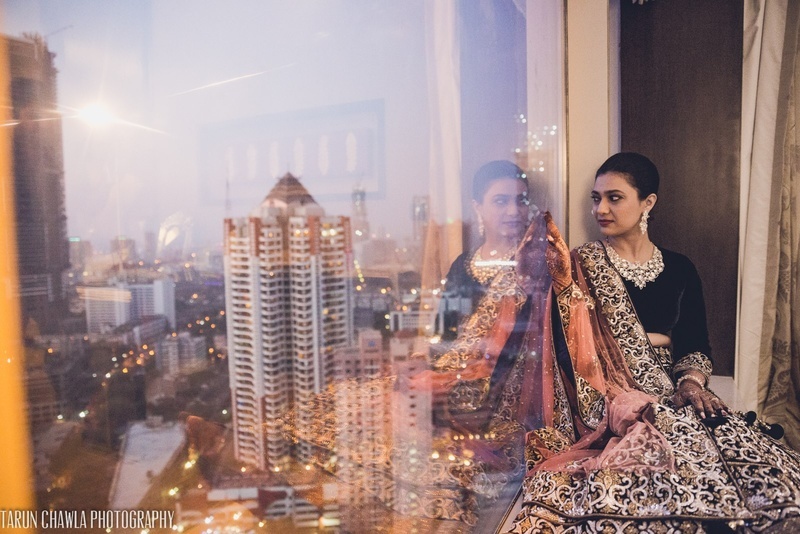 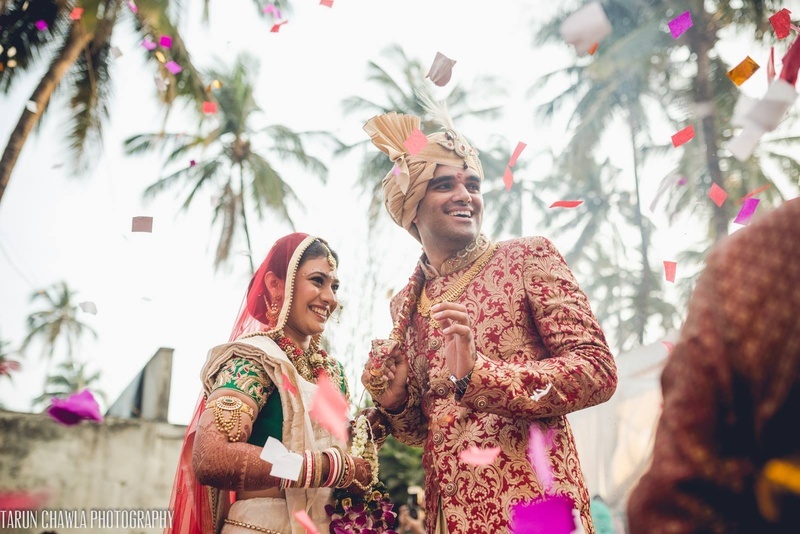 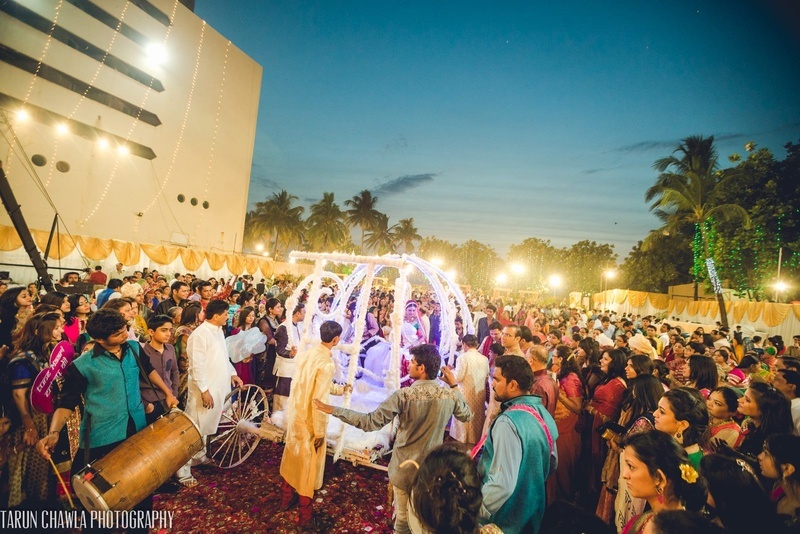 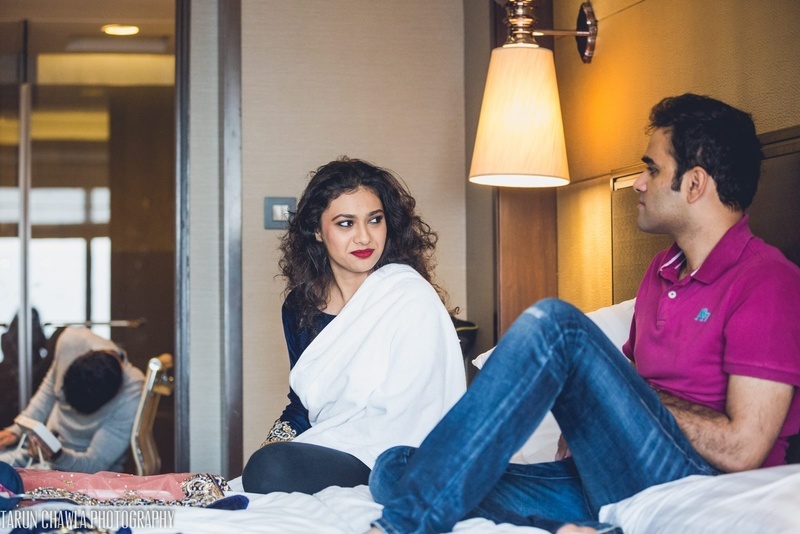 From the dandiya-garba filled sangeet to riddhi’s grand enterance in a white Cinderella-like carriage – this Gujrati wedding was a perfect amalgamation of an Indian wedding with a fairytale touch. 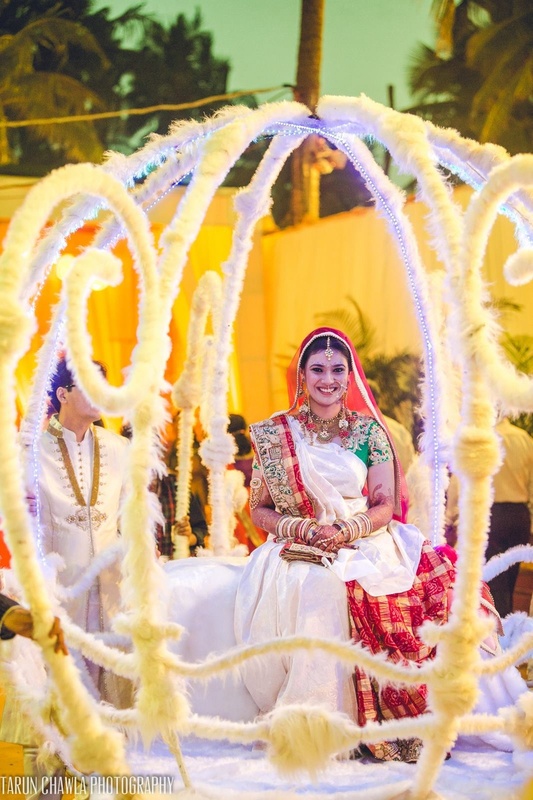 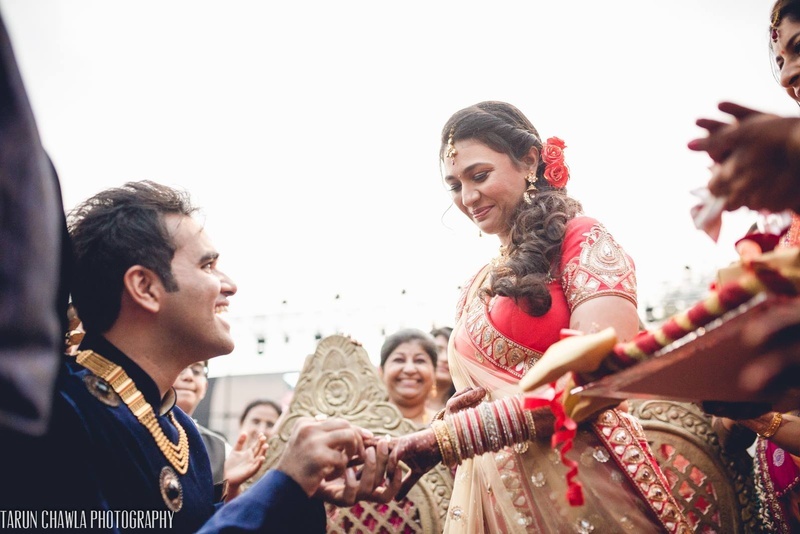 The outfits, jewellery, décor and the ambience of love, fun and colour proved just that! 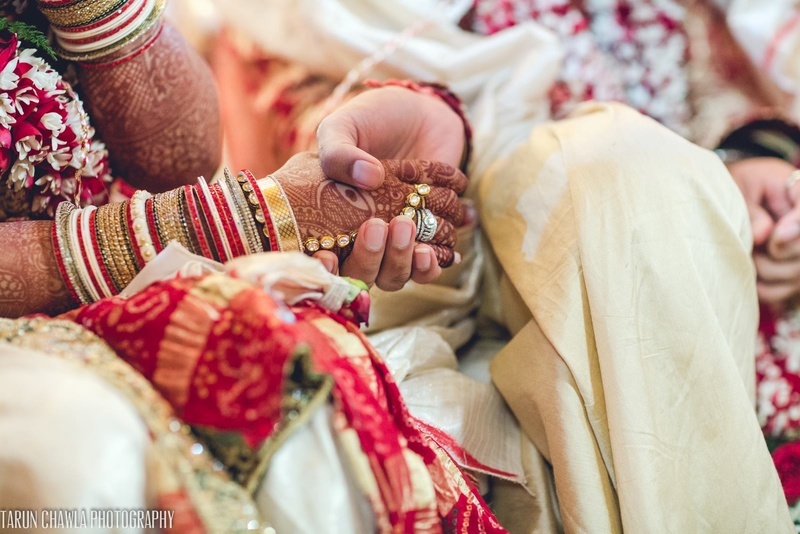 There comes a moment in almost every man’s life when he, with his unusually ticking heart, trembles while putting forward a promise of a lifetime. 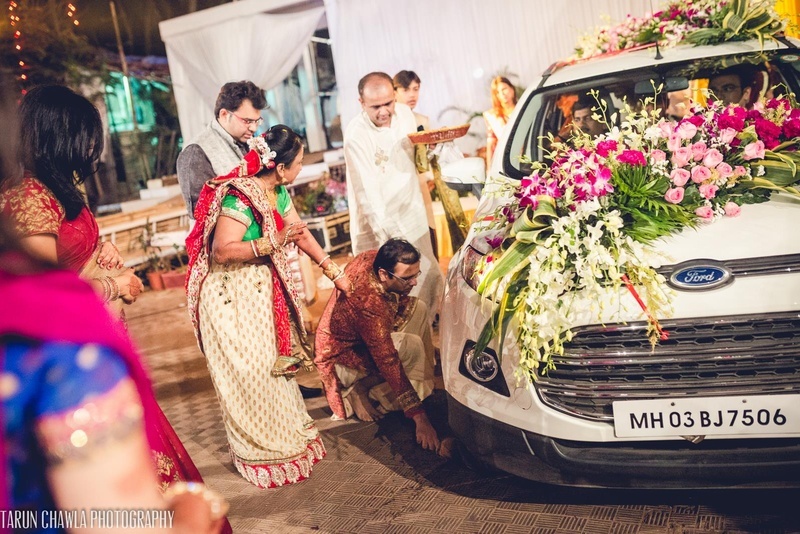 It isn’t something he is waiting for. 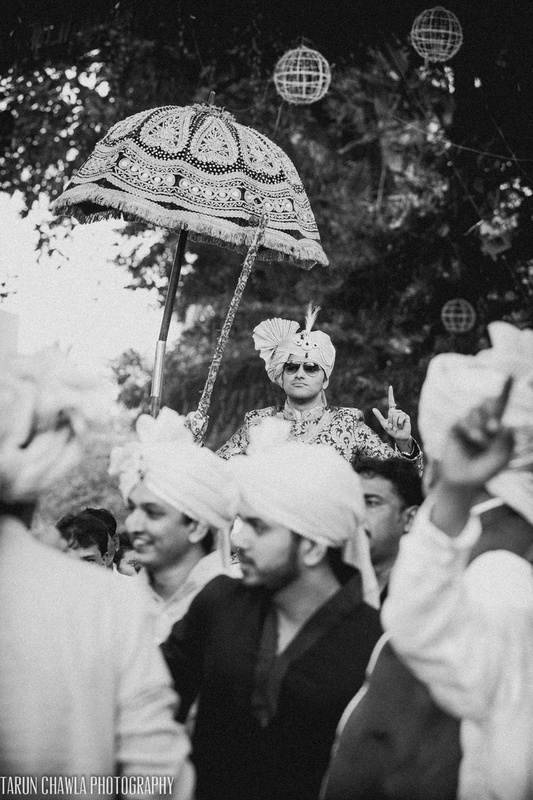 Nor a destination he is seeking. 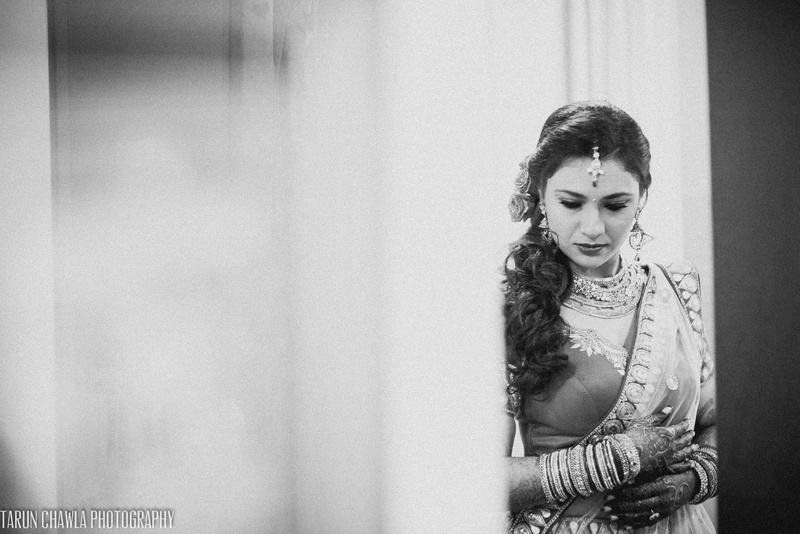 It is in him, all along. 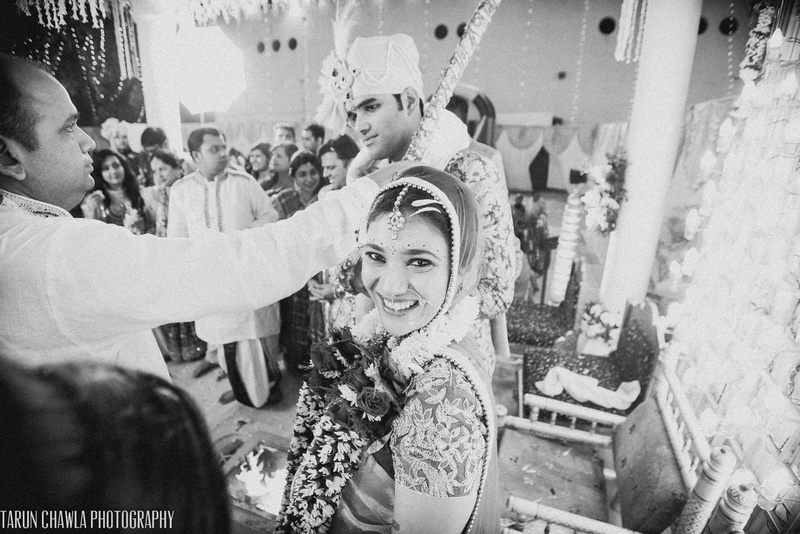 Right since the day he saw her to the moment she said ‘yes’. 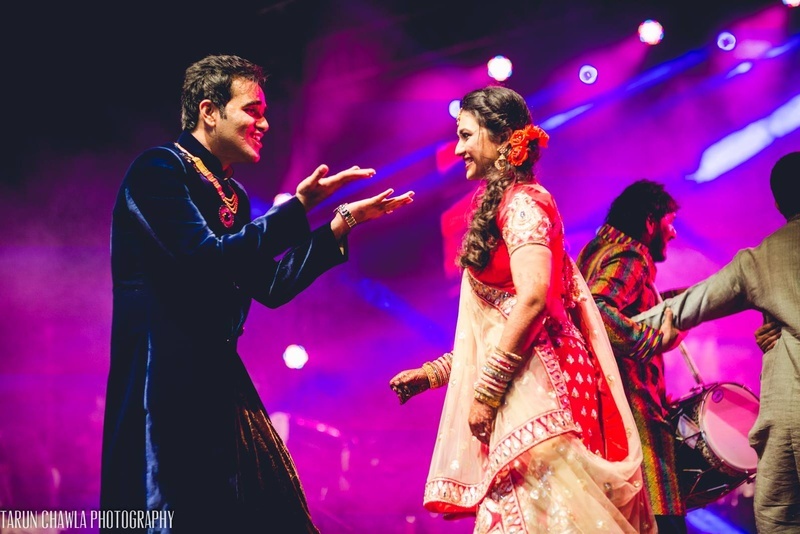 A grand stage was set up under the open blue sky, with loads of lights and live music that got everybody grooving. 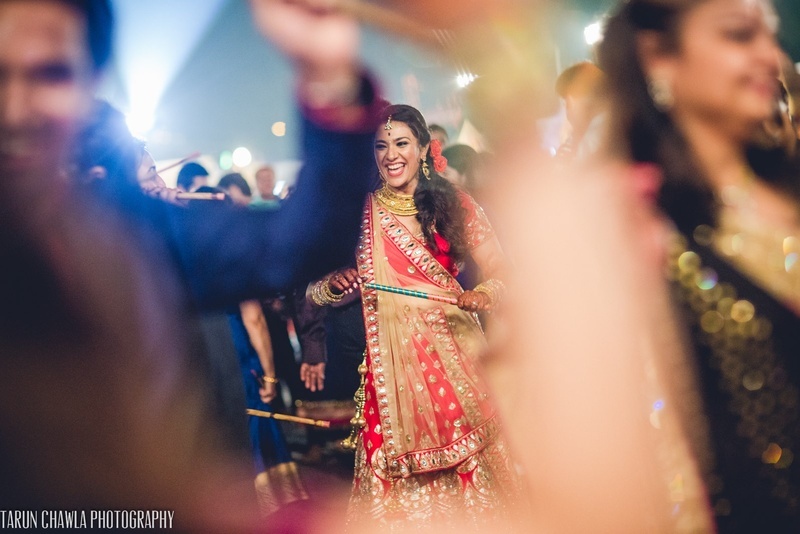 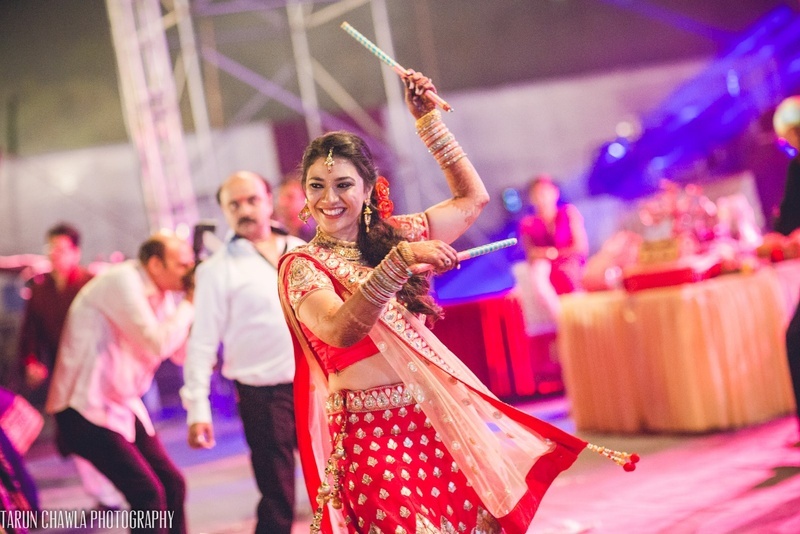 Being a Gujrati wedding, how could this Sangeet be complete without Dandiya-Raas! 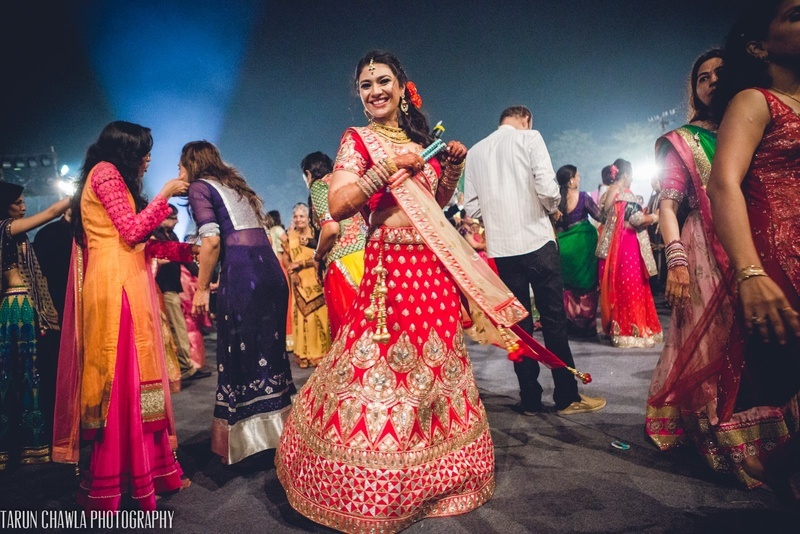 Seeing our gorgeous bride dressed in a beautiful red Anita Dongre gota work lehenga took this energetic outdoor sangeet to a whole new level of grandness. 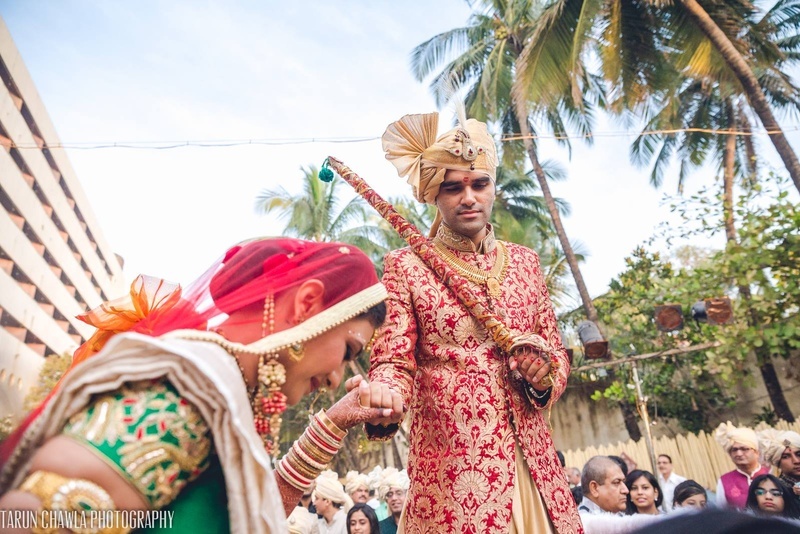 She had side-swept hair with fresh red roses to perfectly complement her beautiful red lehenga while Sidd, the soon-to-be groom also looked his dapper-best in a navy blue velvet sherwani which was accessorized with a multi-strand gold haar that added a regal touch to his entire ensemble. 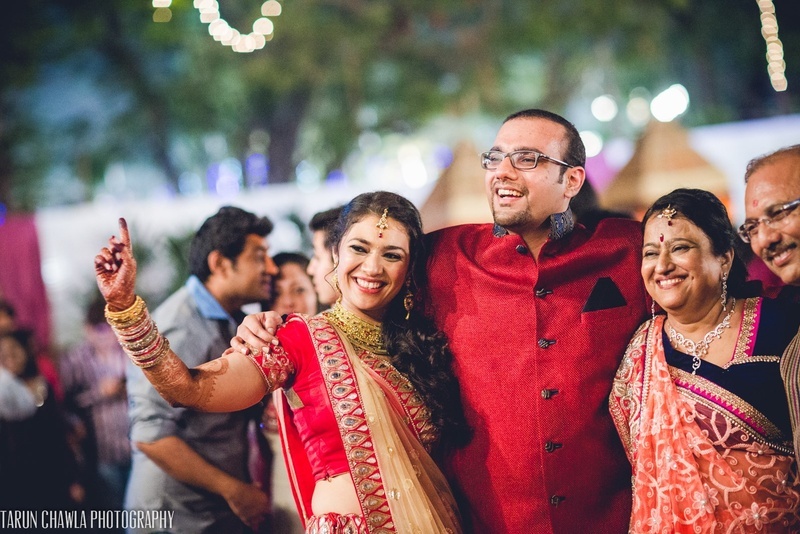 There were dhol-walas, dancing, food, warm hugs and a whole lot of love! 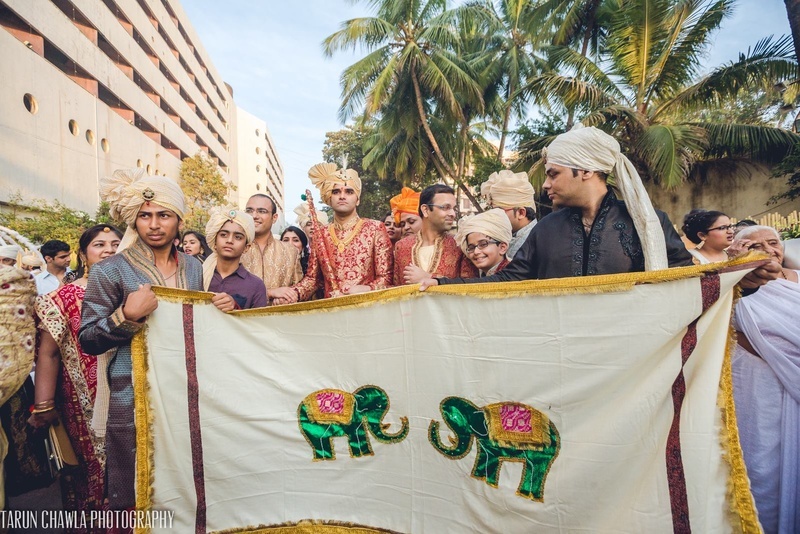 The baarat as you’d guess was loud, dance-y and full of energy! 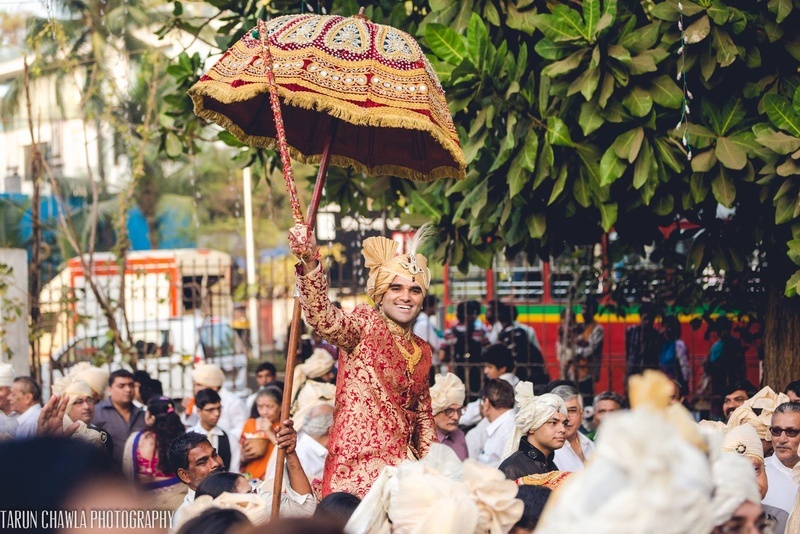 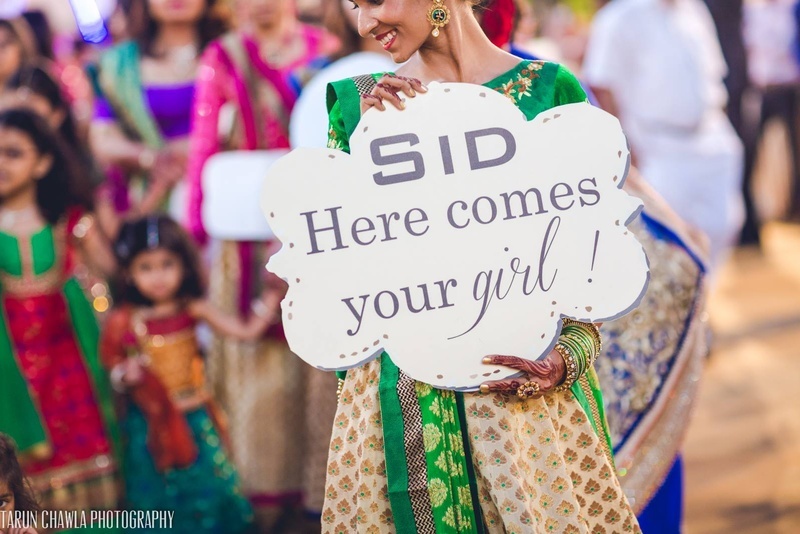 Riddhi and Sidd added their own elements that personalized this funky baraat in the sweetest way. 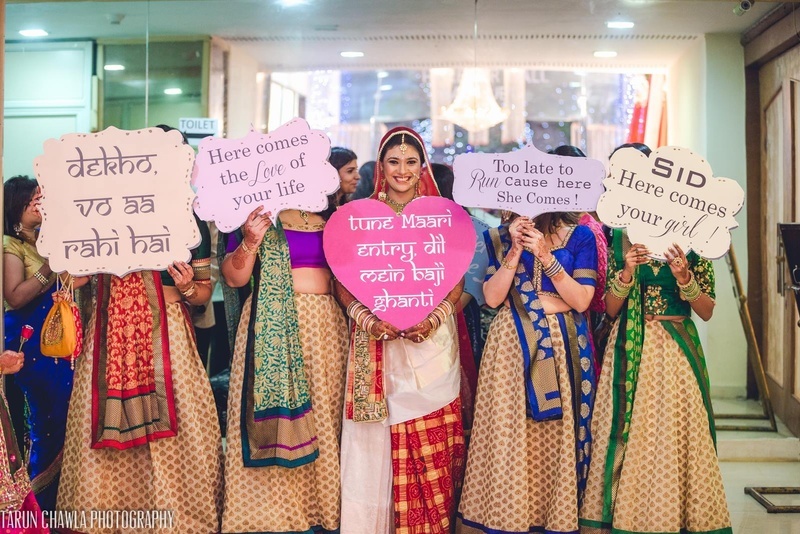 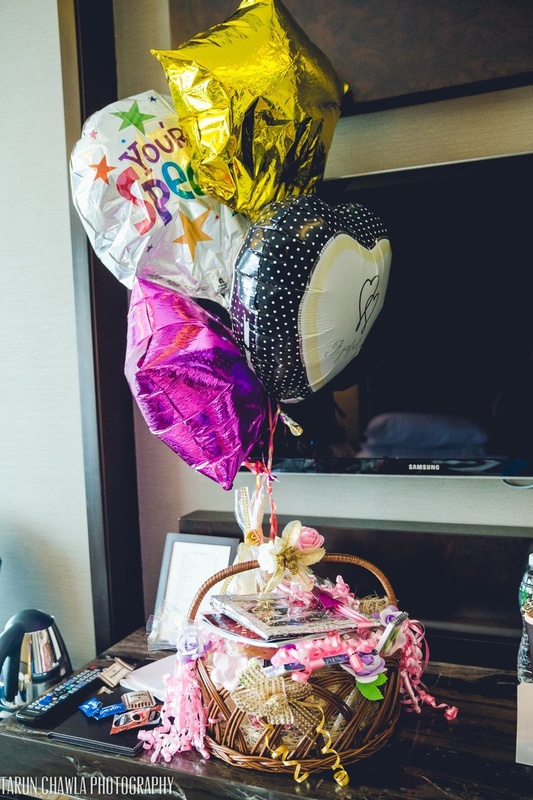 The quirky signage’s with the cute messages and Bollywood song lyrics made her bridal entry even more special. 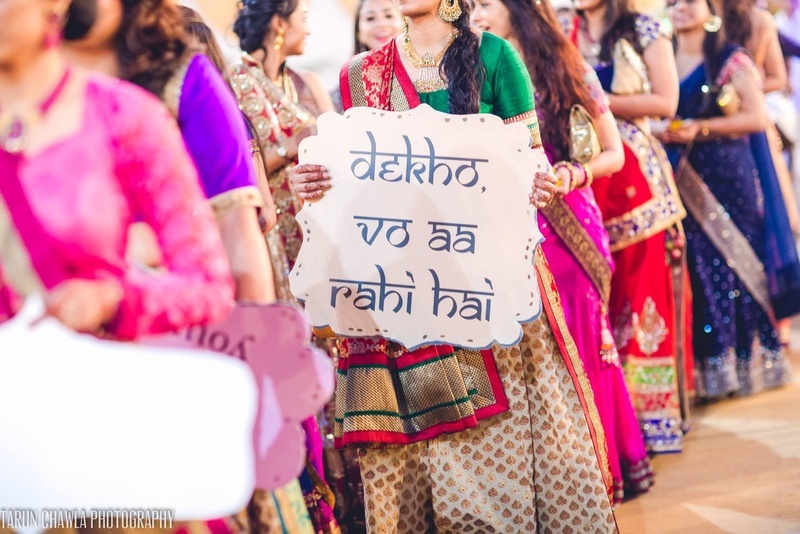 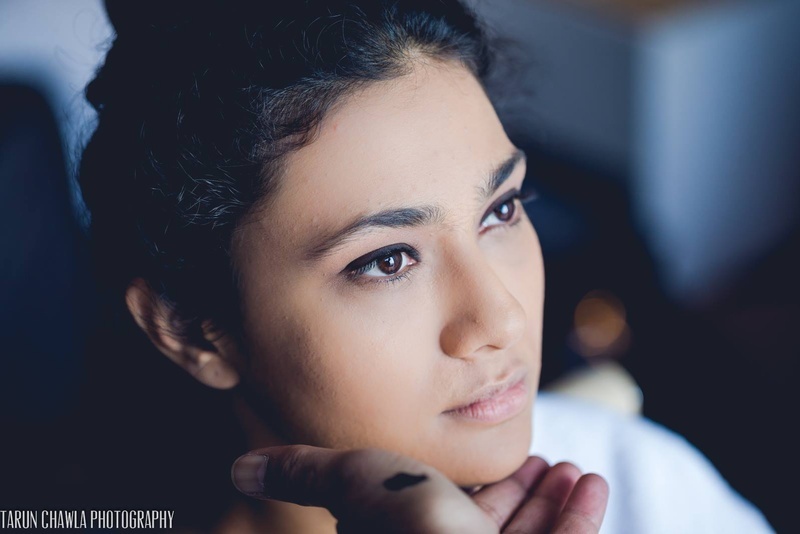 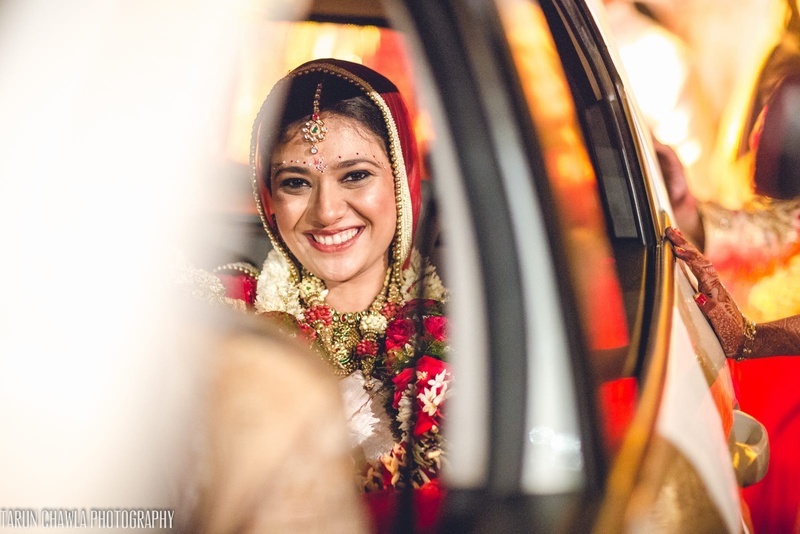 Sign boards reading “Dekho vo aa rahi hai” “tune maari entry, dil mein baji ghanti” and others were held up by her bridesmaids dressed in coordinated lehengas as Riddhi made her grand enterance in a white carriage lit up with fairy lights. 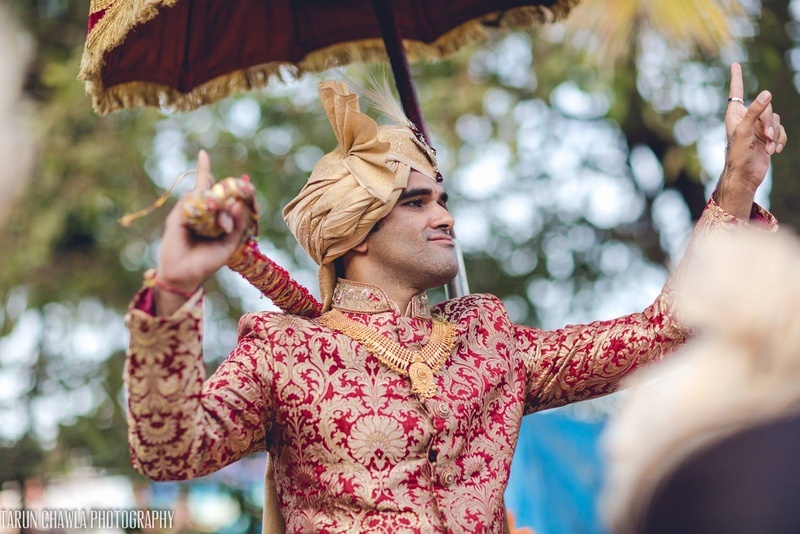 What we just couldn’t miss were the groom’s super stylish red brocade jootis matched brilliantly with his red brocade sherwani. 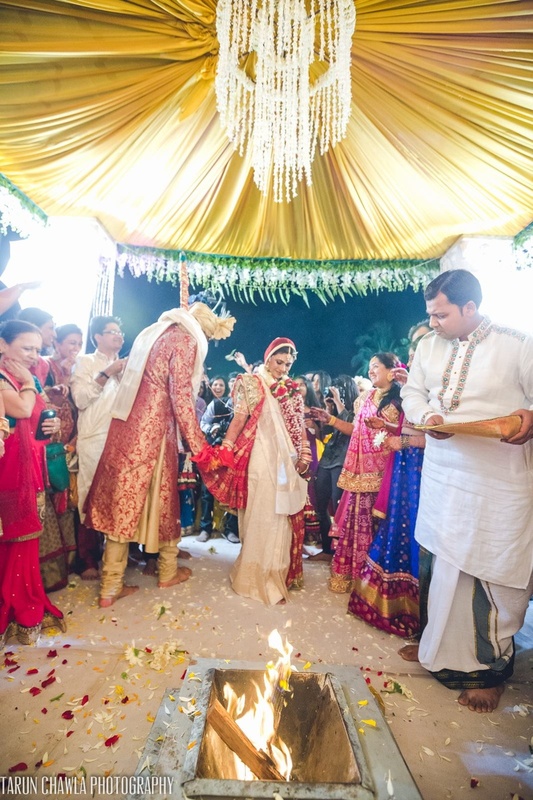 Gold candle wall, floral chandelier mandap and clustered jasmine flowers with fresh green ferns – could Riddhi and Sidd’s Saat Pheras get any prettier? 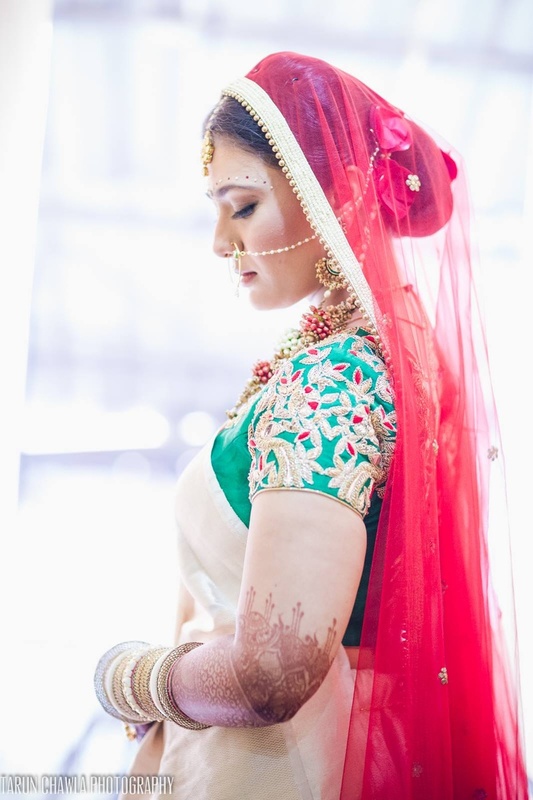 Dressed in a traditional Paanetar saree with a bandhini gharchola, Riddhi looked like a quintessential Gujrati bride. 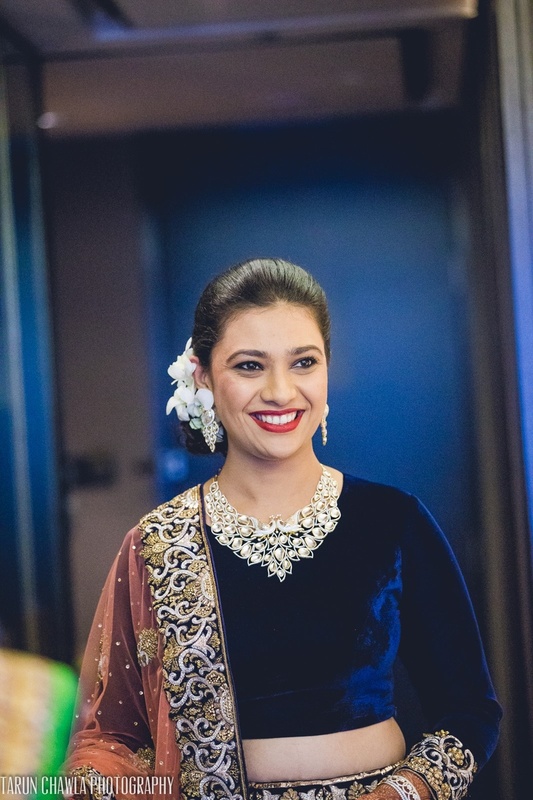 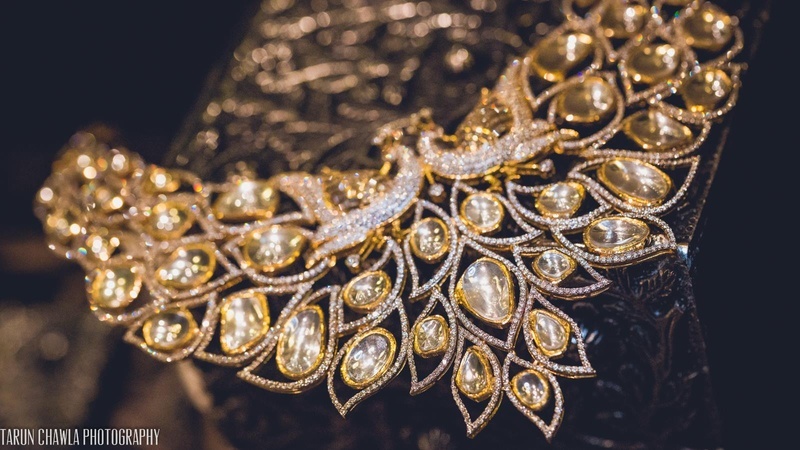 Her kundan maangtikka and delicate nath added the ideal amount of elegance to her entire ensemble. 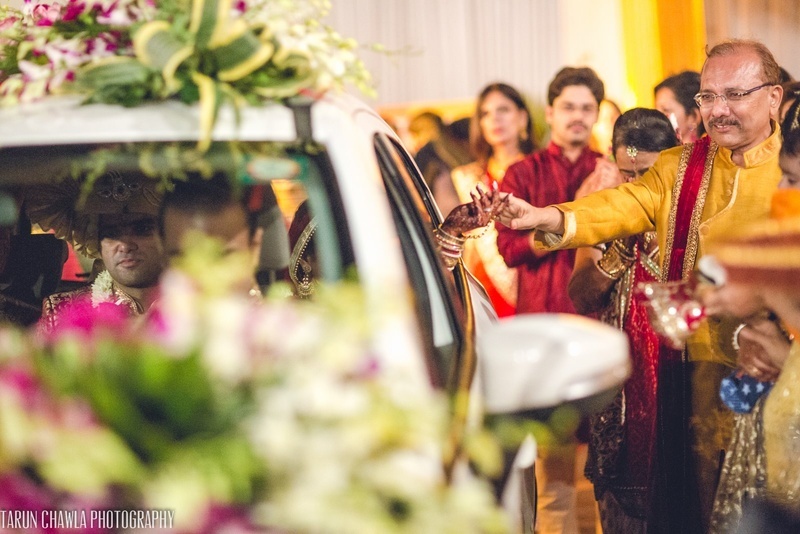 Sid was dressed in a combination of red and gold. 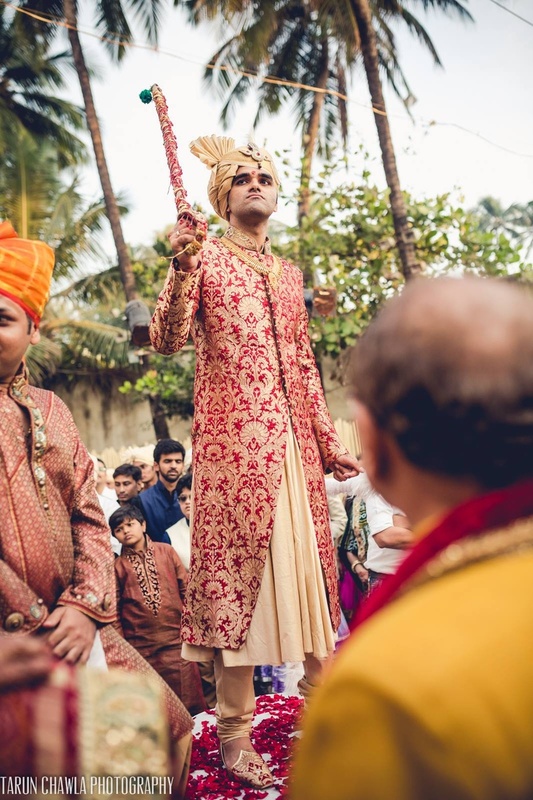 A well fitted sherwani with matching jootis and that gold haar – this groom was checking all the boxes on the super styling groom checklist! 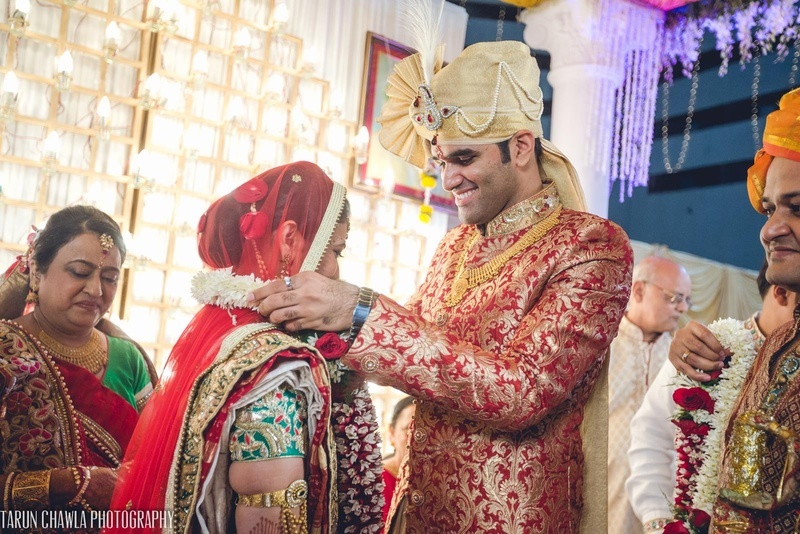 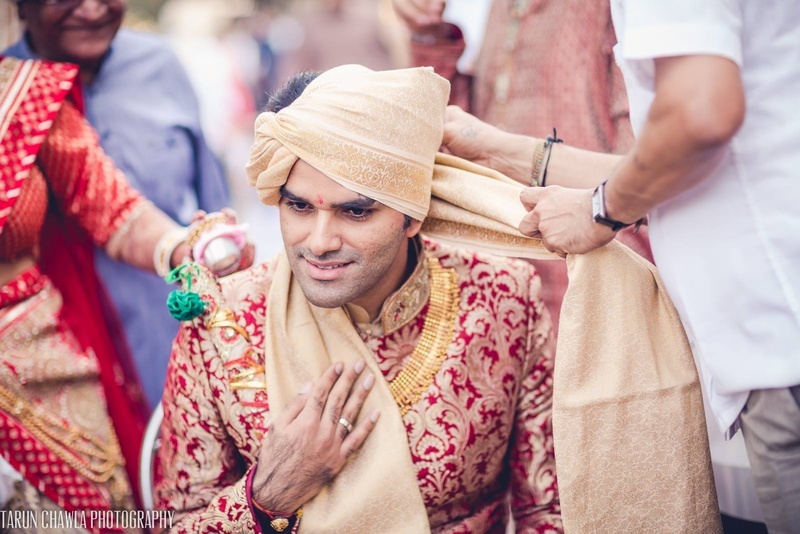 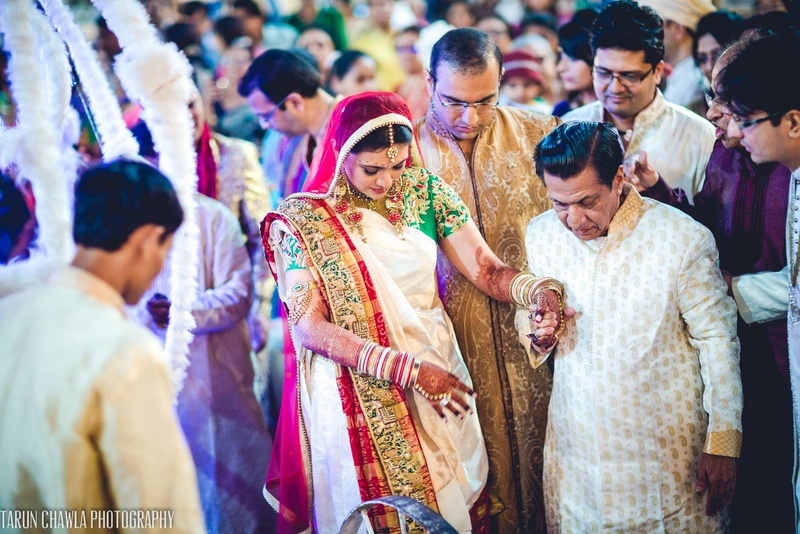 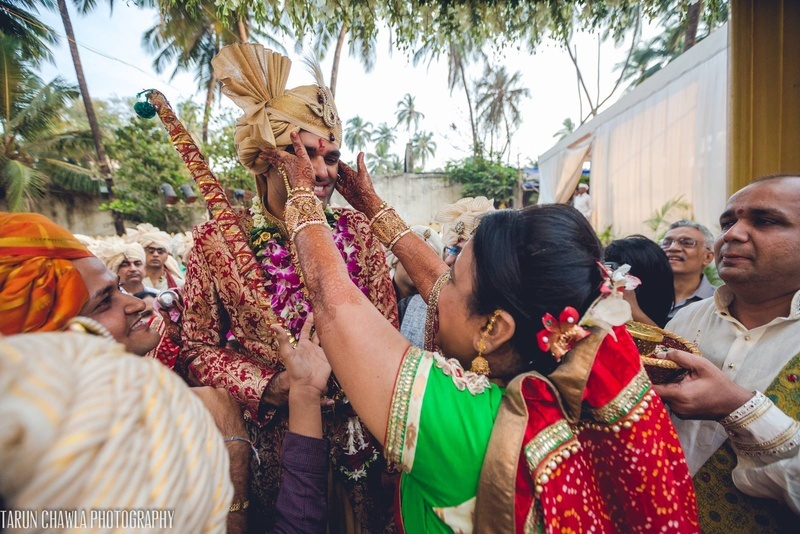 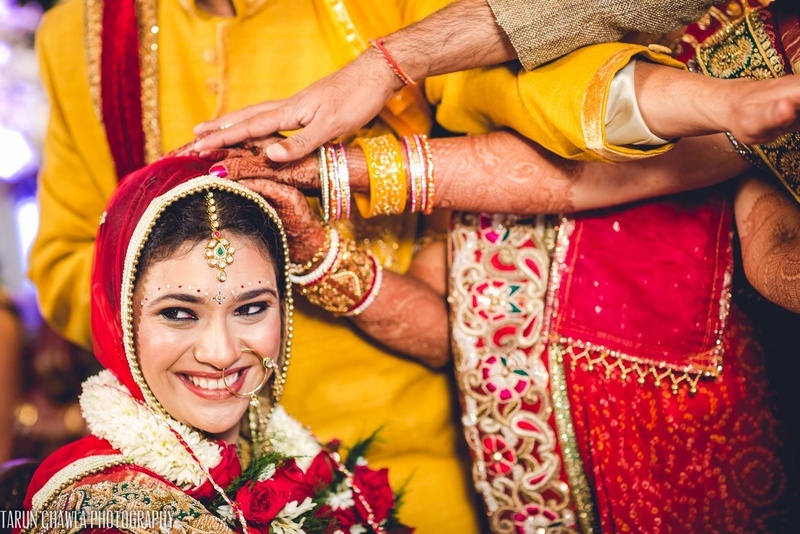 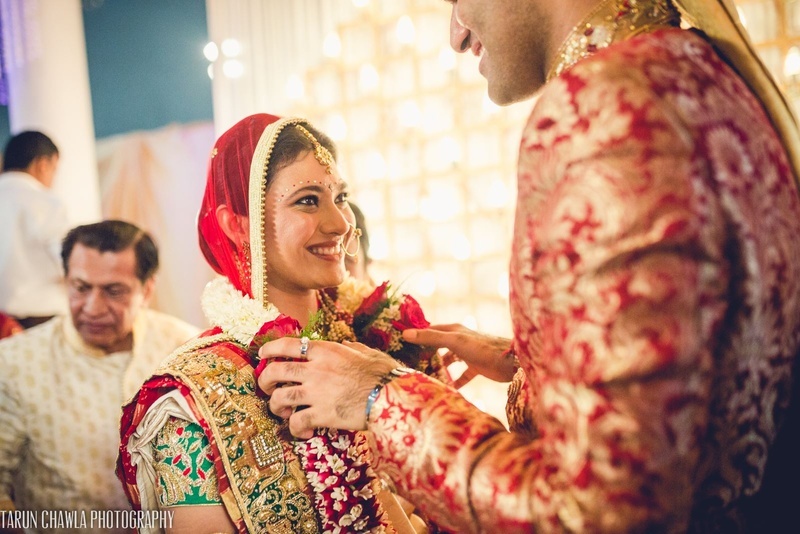 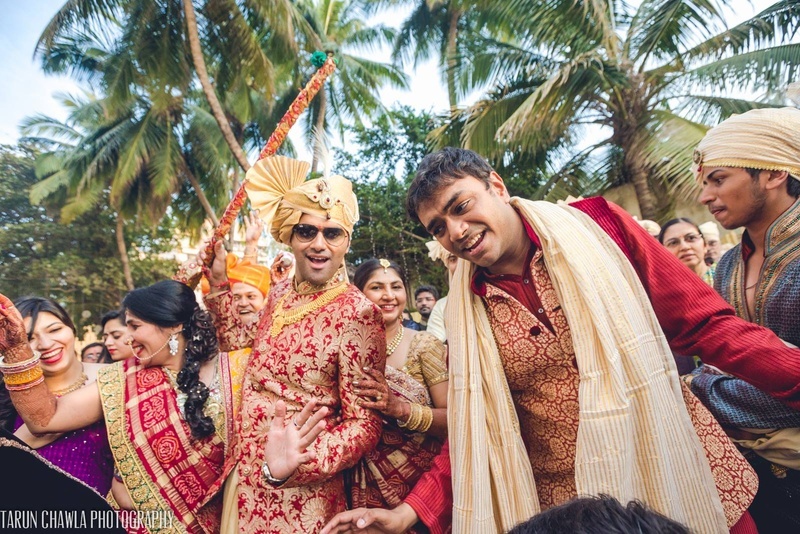 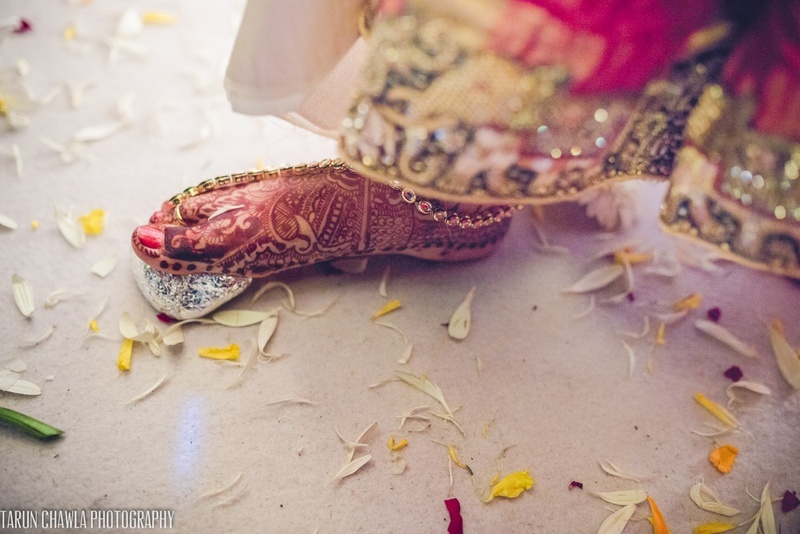 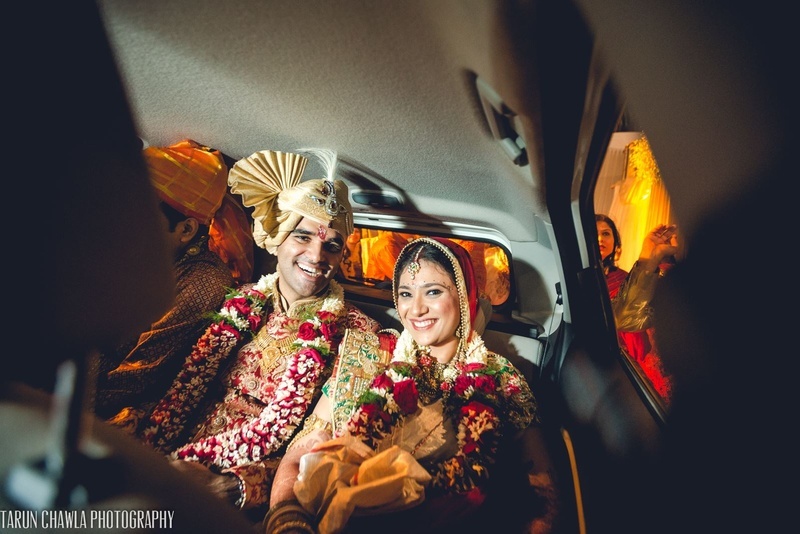 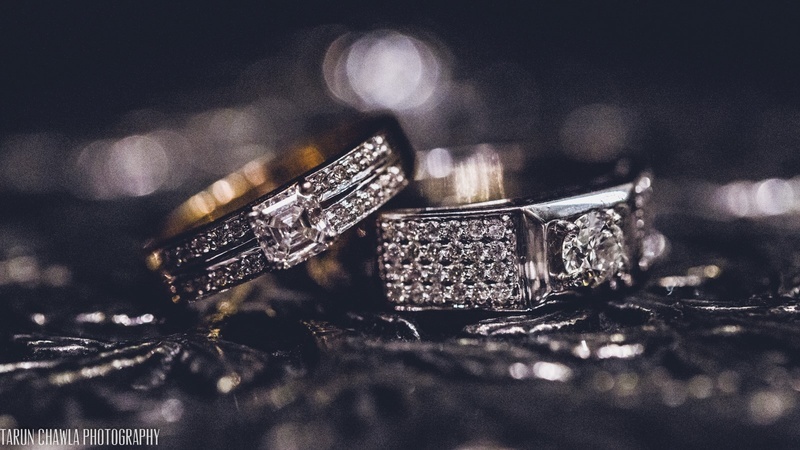 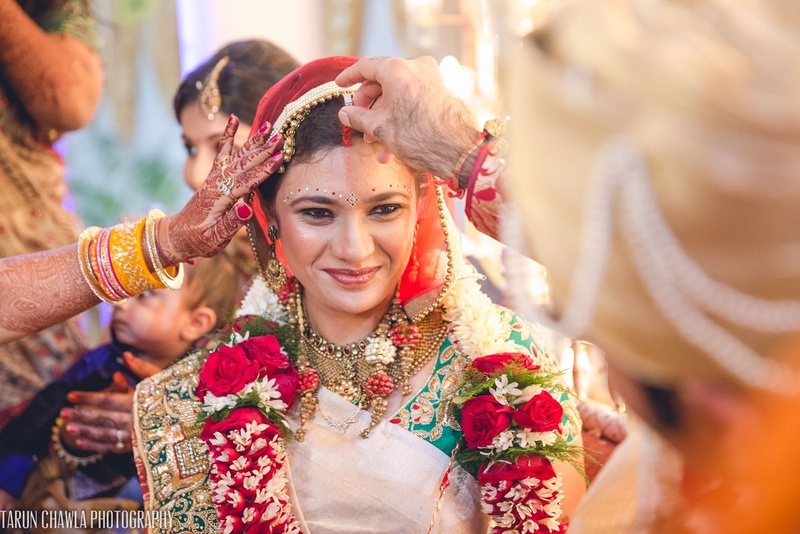 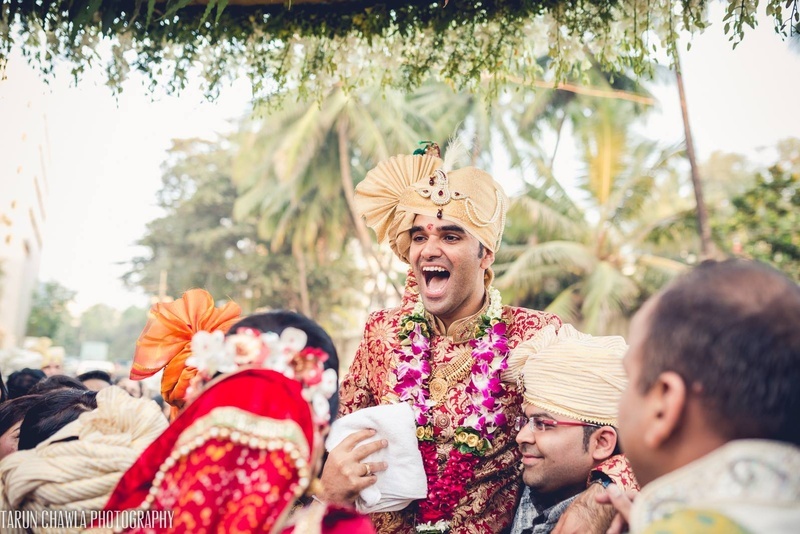 The bidaai is one of the most emotional parts of any wedding ceremony. 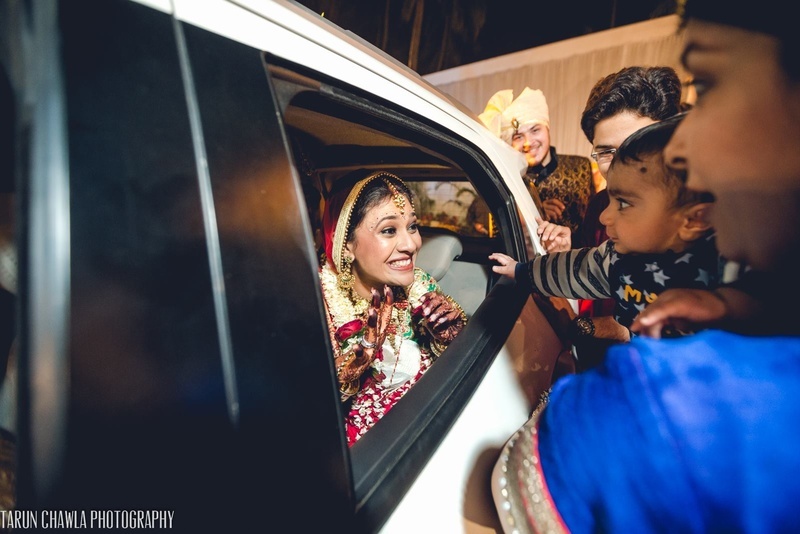 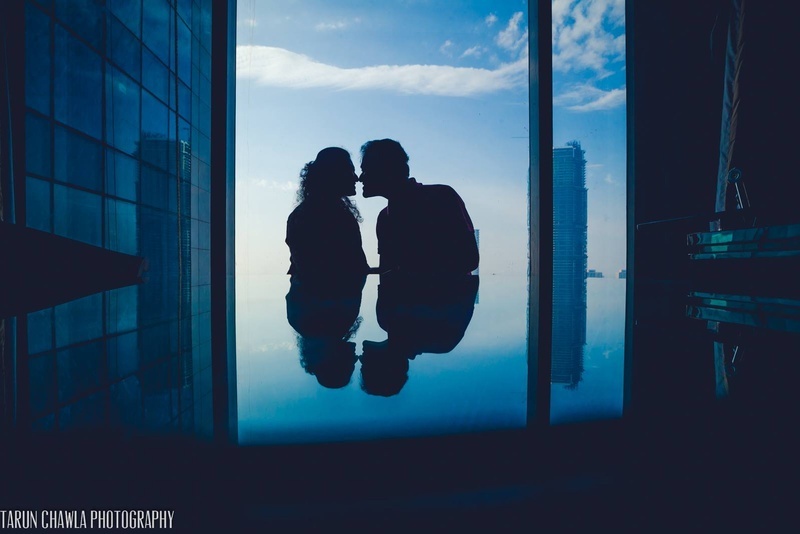 And this one particular picture pricked a spot in our hearts when we saw it - the candid photo captured by Tarun Chawla Photography where the father-of-the-bride and his daughter share an emotional moment holding hands just as Riddhi drives off in the car with Sidd – our hearts completely melted with all the mushy feelings! 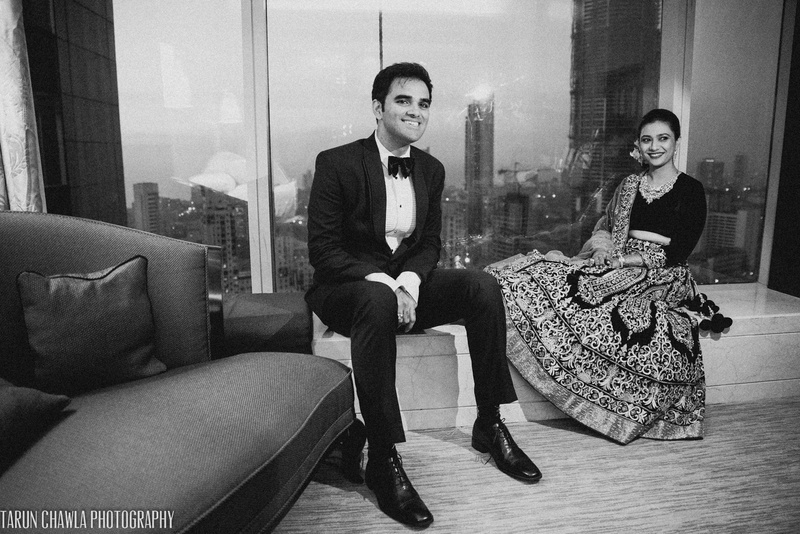 The reception followed the next day where Riddhi and Sid brought on their stylish best. 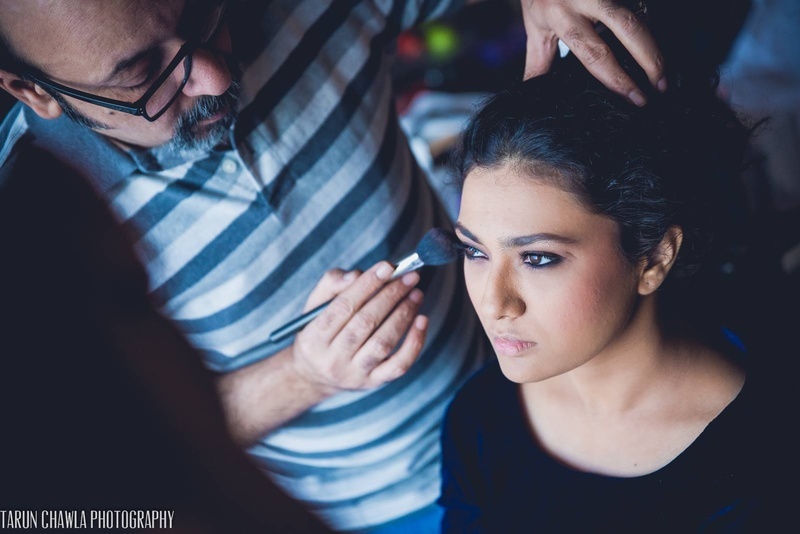 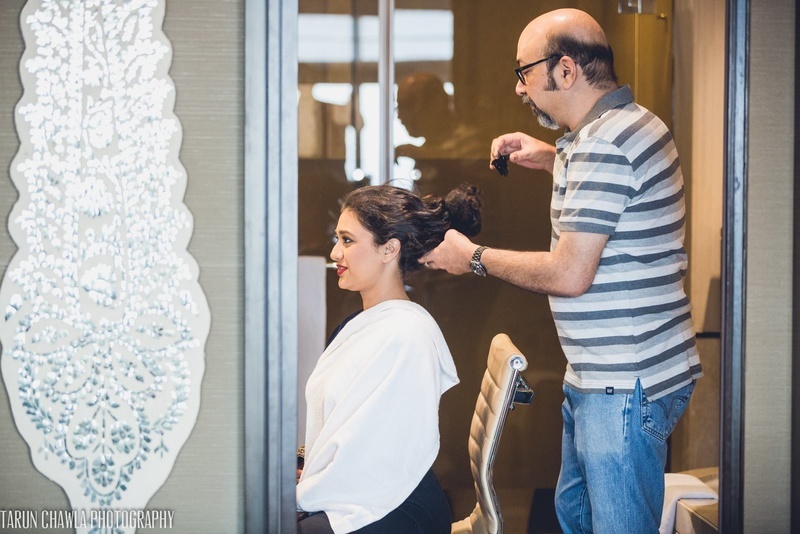 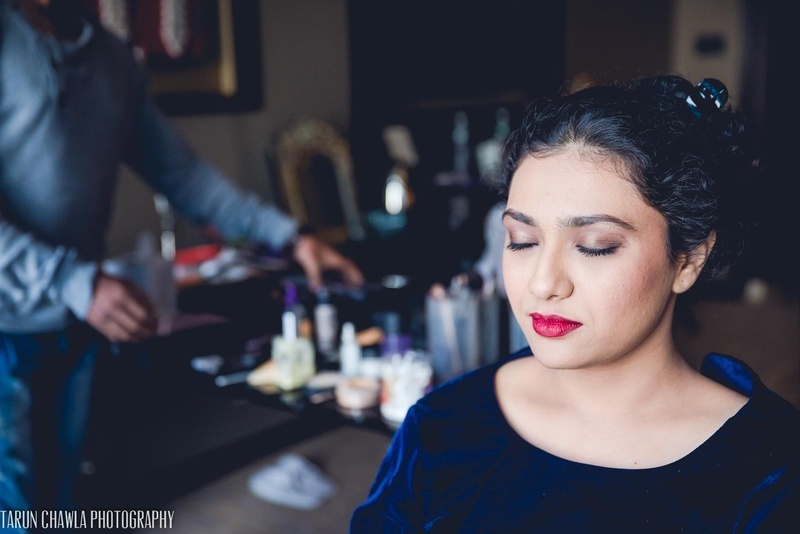 Ace Makeup artist Mickey Contractor worked his magic on Riddhi, giving her bronze eyes and bold red lips – a combination that never disappoints. 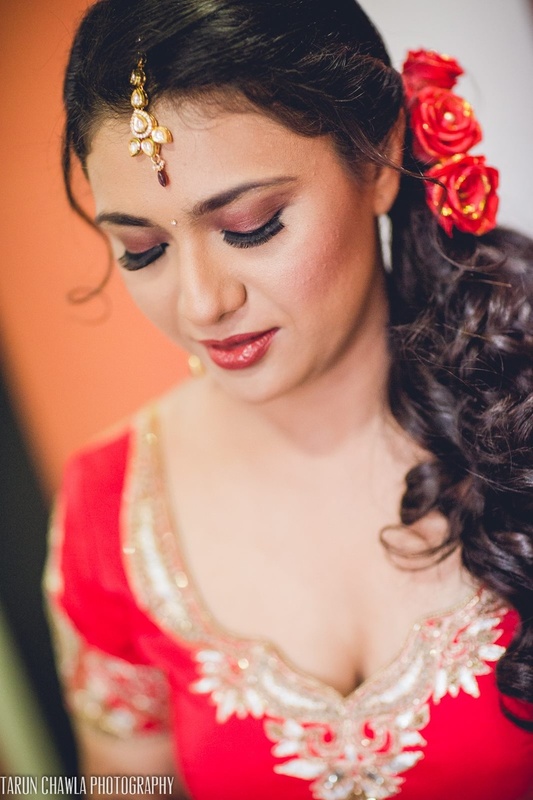 This look was perfect for her navy blue velvet lehenga and coral glitter scattered dupatta. 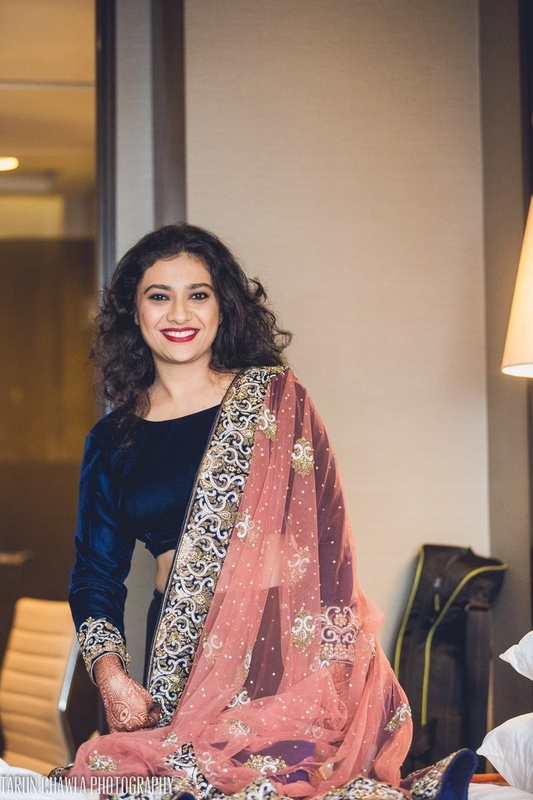 The bold zardosi was most definitely our favourite element of Riddhi’s entire ensemble. 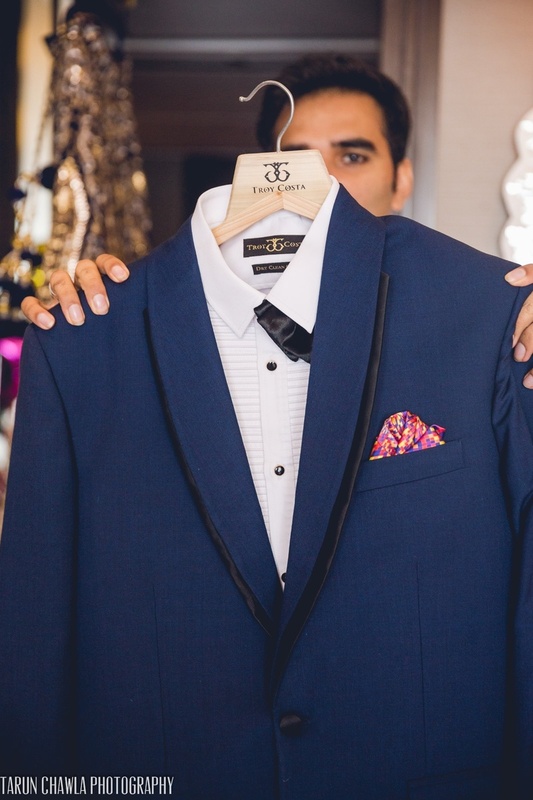 Sidd too brought his A-Game in his Troy Costa tuxedo, custom made to fit him perfectly. 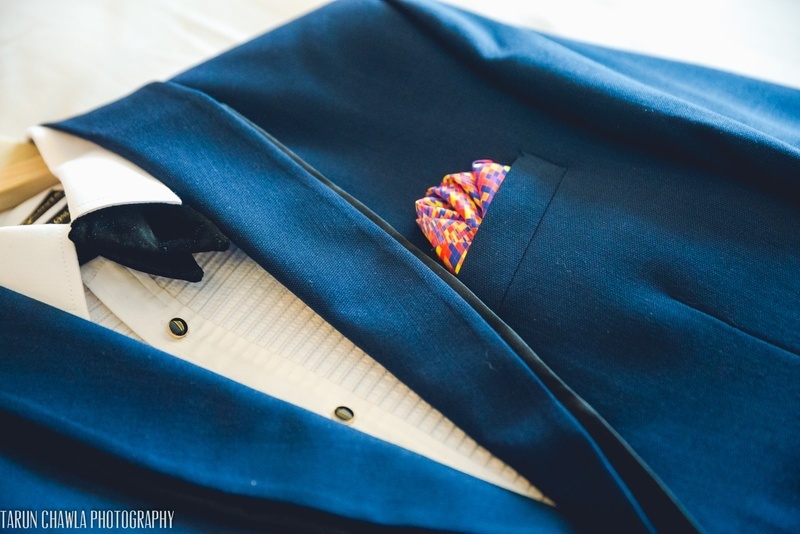 The colourful pocket square was an element that we definitely want to see more grooms incorporating!